With the right products, and a regular cleaning regimen, your floor can maintain its beautiful appearance for years to come. Please find below a list of the main recommended products for cleaning and maintenance of natural stone floors. All available from Naos. If you have a particular concern please do not hesitate to contact us for advice. Power clean is designed for the quick and effortless removal of grease, oil, all kinds of general and ingrained dirt as well as residues from floor polishes. It is an excellent product for final cleaning of new surfaces at building sites and can be used on indoor and outdoor stone surfaces. It is recommended for all types of natural stone, but especially for polished marble and limestone. 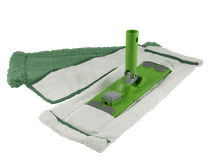 This cleaning kit has been developed for cleaning and maintaining hard floors including natural stone. It has been designed to make the job as easy as possible with a telescopic handle for length adjustment and the practicality of removable heads for dry cleaning and damp cleaning. By far the best mop you can buy for hard flooring. If you do not already have one, call in and ask for a demonstration! Wash & Clean has been developed for continuous care of all types of stone surfaces. It not only cleans, it also enhances and maintains the surface in one action. With regular use coarse and polished surfaces become increasingly beautiful and richer in both colour and structure over time. It is ideal for impregnated or sealed surfaces. This ready to use spray cleans stone and enhances surface protection of all stone tiles. Simply spray on, allow to work briefly then buff dry with a clean cloth. It can be used as often as required to maintain the water resistance and appearance of your tiles, certainly once a week in wet areas. Easy Clean is also ideal for everyday cleaning of small stone surfaces such as kitchen splashbacks, worksurfaces, and bathroom vanity tops. Some stones may have a secondary surface sealer such as Fila Stone Wax or Lithofin Multiseal (both liquid waxes). These tend to enhance the colour and structure of the stone. If your wall tiles start to look flat or become harder to clean, re-apply by wiping on sparingly with a lint free cotton cloth and the wall tiles will come back to life. For floors, mop a diluted mixture onto the floor or re-apply a neat coat and the floor will look great again. Ensure both floor and wall tiles are thoroughly clean and dry before applying.